The center of Jewish worship has always been the temple. But before the temple was the center of Jewish worship, it was the center of Israelite worship. The temple has always been the central focus of God’s chosen people. God chose Israel to be His “firstborn among the nations,” whose responsibility it was to be the salt of the earth – to take godliness, law, and ethics to the world. The tribe of Levi was designated by God as the firstborn of Israel, those who would serve in the temples, houses of God. The Aaron was appointed as the “firstborn” of the Levites, through whose line (through Zadok) would be the high priests of the Aaronic priesthood, those who would officiate in the Lord’s sanctuary. 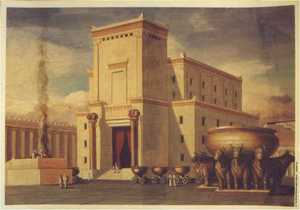 Likewise, the temple sanctuary had a number of courts, from the outer to the inner, growing closer and closer to the holy center, the “Holy of Holies,” where resided the Ark of the Covenant. Although we naturally equate animal sacrifice with Israelite temple worship, animal sacrifice is not necessary for temple worship. It was a feature of the school-master Mosaic Law, meant to bring the children of Jacob to Christ. Symbolism employed in animal sacrifice, such as the laying on of hands upon the sacrificial animal, the transferring of one’s sins onto the animal, and the shedding of the animal’s blood all typified the Savior’s atonement for us. Although there actually were Jewish temples in other locations (Elephantine, Egypt, to name one, and in the Americas as recorded in the Book of Mormon [2 Nephi 5:16]) most of us assume that there could only be one temple for Israel, the one in Jerusalem, and certainly, as time has gone on, Jerusalem has been the only focus in looking forward to a “third temple” for the children of Israel. The remaining western retaining wall of the mount attracts tourists and worshipers from all over the world. At the present time, although the temple mount is politically in Israel’s hands, a Palestinian “Waqf” organization oversees the entire top of the mount, and Islamic mosques are the most prominent features there. The mosque called the Dome of the Rock—which was built during the same period as the Al-Aqsa Mosque to the south, between A.D. 685 and 715— is built on top of the Foundation Stone, which is sacred to both Jews and Muslims. According to Jewish tradition, the stone is the “navel of the Earth”—the place where creation began, and the site where Abraham was poised to sacrifice Isaac. For Muslims, the stone marks the place where the Prophet Muhammad ascended to the Divine Presence [in a dream—Mohammed was never in Jerusalem]. Jews rarely mount the long walkway from the plaza of the Western Wall to the top of the mount. Researchers have not yet determined exactly where on the mount the holy temple stood, and where the Holy of Holies would have thus been situated. To step on the spot where the Holy of Holies was located would be a sacrilege. Any sort of digging or visiting or religious worship anywhere on or around the mount can inflame the passions of those who revere the place. Every activity related to the Temple Mount causes controversy so strong it sometimes leads to violence. Indeed, a visit by Israeli leader Ariel Sharon to the Temple Mount ignited a Palestinian uprising that lasted for years and claimed over 6,000 lives. Arab and Israeli archaeologists are suspicious of each others’ temple mount research, because anything found might enhance the claims of one or the other to this precious piece of ground. While Moslems continue to consider the Dome of the Rock their third holiest site, Jews count the Temple Mount as their most holy site. And he spake also concerning the house of Israel, and the Jerusalem from whence Lehi should come—after it should be destroyed it should be built up again, a holy city unto the Lord; wherefore, it could not be a new Jerusalem for it had been in a time of old; but it should be built up again, and become a holy city of the Lord; and it should be built unto the house of Israel—(Book of Mormon, Ether 13:5). Mormons believe in the Holy Bible and accept all the Old and New Testament prophecies of the future of Jerusalem and the Holy Temple, wherein the temple will be rebuilt and Jerusalem become sanctified, a holy city. The Book of Mormon validates these prophecies, including the physical and spiritual regathering of Israel. And then also cometh the Jerusalem of old; and the inhabitants thereof, blessed are they, for they have been washed in the blood of the Lamb; and they are they who were scattered and gathered in from the four quarters of the earth, and from the north countries, and are partakers of the fulfilling of the covenant which God made with their father, Abraham (Book of Mormon, Ether 13:11). And he shall sit as a refiner and purifier of silver; and he shall purify the sons of Levi, and purge them as gold and silver, that they may offer unto the Lord an offering in righteousness. Then shall the offering of Judah and Jerusalem be pleasant unto the Lord, as in the days of old, and as in former years (Book of Mormon, 3 Nephi 24:3,4). This page was last edited on 24 June 2012, at 19:58.